MSU is developing a robotic fish to monitor water temperature and other environmental indicators in the Great Lakes. A lot of sci-fi movies and books feature robots that look like people. Think the Terminator or C-3PO. 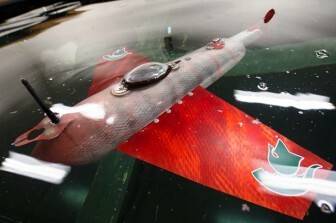 But a Michigan State University engineering professor went in a different direction when he started working on building a robotic fish about 10 years ago. Current State’s Mark Bashore talks with Dr. Xiaobo Tan, an associate professor in the Department of Electrical and Computer Engineering at Michigan State University. He’s been working on a robotic fish that can be used for monitoring water quality. This segment was produced by WKAR’s Current State and is reproduced with permission. It looks like the wrong audio was linked to this story. The audio clip provided is an interview about the musical “Once” and there is nothing related to the robotic fish research. Please correct this.